Table of 3's mobile broadband tariffs, to be launched on 3 September. UK mobile operator 3 has officially disclosed details of its new tenner-a-month data deal for laptop users. Our story on Monday prompted punters to call the 3 sales line, only to be answered by reps who didn't know anything about it as the new tariffs had yet to be announced, and they had yet to be briefed. Well, the service goes live on 3 September with a phased roll out: Londoners inside the North Circular, England north of Birmingham, Scotland, and Ireland get access first, but by December the operator estimates 85 per cent of the UK population should be covered. It's 2.8Mbit/s HSDPA (what 3 calls "3Turbo"), and the prices are as we reported earlier this week. 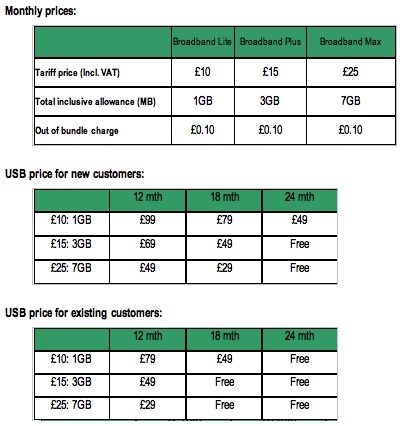 The Broadband Lite package starts at a tenner a month for 1GB (10p/1MB over), Broadband Plus at £15 a month gets you a 3GB bucket, and Broadband Max costs £25 a month for 7GB. The 1GB deal throws in an additional 280 text emails, 80 music downloads, and 20 hours of video streaming. The price of the USB dongle with which you access the network varies according to length of contract, the data plan you choose, and whether or not you're an existing 3 customer. It's free for all existing customers who take out 18 or 24 month contracts, for example, regardless of the plan. It's also free for new customers who take out the Plus and Max plans for 24 months. New customers otherwise pay between £29 and £99 for the dongle. Or you can just buy the dongle outright for £99. This, and 3's sales pitch that data is "not just [for] men in grey suits", indicates that it's making a broad pitch for "pro-sumers" rather than business users. The aggressive tariff undercuts T-Mobile's Web'n'Walk Plus plans, which offer laptop users "Unlimited*" web access via USB dongle or data card for £29 or £44 a month. Of course, adding Web'n'Walk to your phone costs only £7.50 a month, but the Fair Use policy explicitly states: "We do not permit use of this service to provide modem access for a computer or for peer to peer file sharing, internet phone calls or instant messaging. " Finlay Dobbie points out: "You can add web'n'walk plus to your phone tariff for £12.50/month, then you can use your phone as a modem for your laptop. Which is cheaper than 3's forthcoming "Broadband Plus", just!" Michael J adds: "Hopefully they will at least tell you when you are getting close to the gigabyte. It may be that my days of smirking when other people in their cafes look at me curiously because my laptop is connected to the internet and theirs aren't are nearing their end." Declan in Eire hopes the service is better than 3's in the Republic: "There are over 1,000 posts in this thread regarding 3 Ireland's appalling service... Constant outages, wildly fluctuating speeds, no SMTP server..." No SMTP server?